Until recently, the goal of my office space was solely to do my work; edit wedding photos, communicate with clients, plan for shoots, store my camera equipment, etc. This year a business goal of mine was to transform the office into a simple, efficient, and inspiring space in which I could invite clients and vendors. I also wanted this space to represent the aesthetic elements which I love photographing like clean architecture along with styled interiors and decor. I wanted the space to make sense and be beautiful! I purchased this clean, neutral couch from my sister-in-law who no longer needed it. It's originally from West Elm. It paired well with the shelf from Target and marble coffee table from World Market. 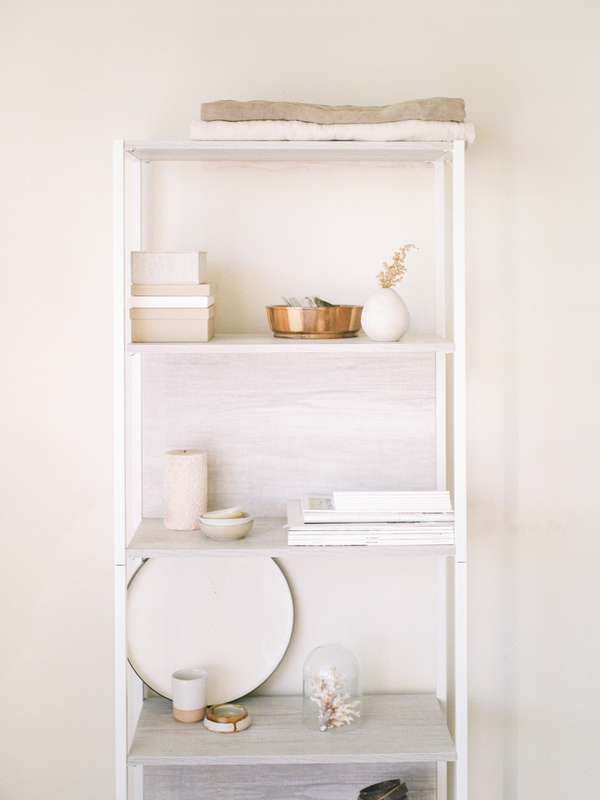 I like to use the shelf to store some of the styling pieces I use in flat lay designs that I photograph, along with some art that I've purchased. Since taking these photos a couple of weeks ago, I've purchased two paintings that I've added to the shelf that fit in nicely with the rest of the items. I also have paper goods & marketing pieces that I store on the shelf for when clients & fellow wedding vendors stop by. But of course this room would be no meeting space without fresh florals. I always love having flowers around no matter what the occasion, and my kind friend Elizabeth with The Petaler arranged this beautiful work of art. I love hosting in any form, so along with florals I try to have some sort of snack and drink available as well even though that didn't make it into these photos. While there are some remodeling ideas I have for this room, this was an excellent starting point for this studio office space. If you're ready to book your wedding or portrait session, please feel free to contact me and we'll get you over to the office for some wine, cheese, and good conversation!